Be part of our team raising funds to support a network of clubs across England and Wales offering lots of great activities which members of all ages and abilities can share and enjoy together. There are over 150 Phab clubs with 8,000 members in all age ranges from under 8’s to over 80’s right across England and Wales. 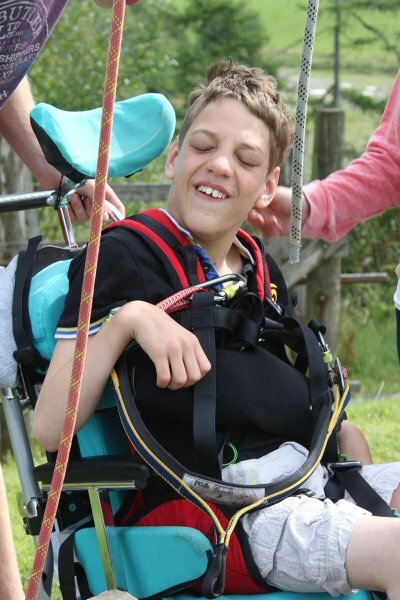 Help us to provide much needed places on our unique Phabkids weeks for youngsters with a range of disabilities and complex needs, enabling them to experience and enjoy greater independence and freedom. Phab is very fortunate to have the support of some amazing volunteers who give their time and effort not only during the weeks away, but also at the required training sessions and huge thanks goes out to every one of them! Every year Phab provides a challenging and exciting programme of ILX Residential Projects for children and young people who have disabilities or who are disadvantaged in some way. We are most grateful to our Marathon runners, cyclists and all those who raise funds to support both the Phab Projects and 170 Clubs across England and Wales with over 8,000 members. Through the challenging and exciting activities on offer and the experience of being away from home and just having great fun together, the children build their self-esteem, confidence and independence and learn new practical, personal and social skills which all helps them when they go back home - along with some great memories and new friends made. And to fulfil Phab's overarching aim of promoting understanding and inclusion of disabled and non-disabled people, a small number of children attending are not disabled but disadvantaged in some way, perhaps in foster care or having experienced abuse or bereavement, or they are the sibling of a child attending with a disability. We are also looking forward to working with the Jubilee Sailing Trust, with five more disabled people having a place on one of their very special tall ship voyages in 2018. The activities the children and young people are able to enjoy include canoeing, sailing, caving, swimming, mountain biking, rock climbing, abseiling, archery, table tennis, pool, ropes course, zip wire, tube slide, sensory room, crazy golf, ten pin bowling, pottery, whacky races, visits to the seaside with fish and chips for supper or to the circus, and all finished off with a fancy dress party with karaoke and disco. We know from our involvement with parents, carers, voluntary and statutory organisations that there is an enormous need for parents and carers to get a break now and then, whilst children and young people want to do something challenging, worthwhile and fun. And families with one or more disabled children often experience a disproportionate level of poverty due to the cost of equipment and specialist care, parents not being able to work because of their caring responsibilities, and family breakdown. Our residential projects provide a break which most families would not be able to afford, thanks to the efforts of all our supporters. And parents can see a real difference in their child when they return back home which can have a real impact on family life as a whole. The full programme of Phab’s ILX Residential Projects costs around £128,000 a year – an average cost per place of around £595 for each of the 215 children, young people, older people, volunteers and carers taking part. The majority of that total is for accommodation and activities at the Outdoor Activity Centres. Below are some of the key costs for a seven night project based on a total of 55 people – 30 children and young people and 25 volunteers and carers. Laundry/medical equipment includes hire of hoists etc.